In this video guitar lesson I’m going to show you how to change the strings on an electric guitar. Changing strings on an acoustic guitar is mostly the same, you just need to attach the string to the bridge in a different way. Changing your strings is one of the most basic guitar maintenance tasks that every guitar player should be able to do. Strings will break, or just get old and dead sounding and need to be changed. You could take your guitar to a local music store or repair shop to have your strings changed, but it’s really not that difficult once you get the hang of it. How often should you change your electric guitar strings? You should change your strings at least every 2 or 3 months, but this can vary so much from player to player. Professionals will change strings for every gig. Do not change your strings only if they break. 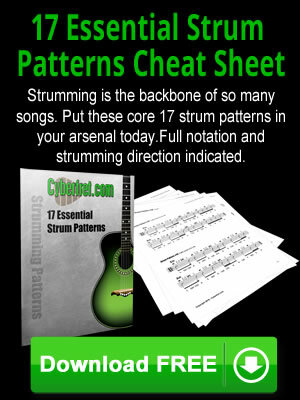 You need to change all of the strings on your guitar at the same time on a regular basis. The gauge of a guitar string is the thickness measured in inches. I live in the United States, so that’s how guitar strings are sold here. I’m sure they’re probably sold in millimeter gauges elsewhere, but I can just go with what I’m familiar with. Before I can make a suggestion as to which gauge of strings you might use, you will need to determine the scale of your electric guitar. Now I don’t mean scales like you play on the guitar. But the length of the strings from the nut to the bridge. 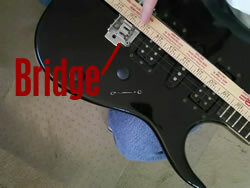 For this step, grab a yard stick and measure from the edge of the nut of your guitar to the edge of the bridge. I know the edge of the bridge can vary a little from string to string. But that’s OK. 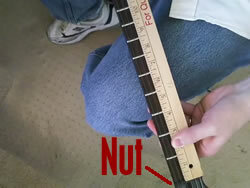 If you want exact, measure from the nut to the 12th fret bar and multiply by 2. Now there are some variations, but basically think about dividing electric guitars into 2 basic camps. Guitars with a scale of 25 1/2 inches, and those that are 24 3/4 inches. The most common style of electric guitar that is a 25 1/2 inch scale is a Fender Stratocaster. The most common 24 3/4 inch scale electric guitar is a Gibson Les Paul. The most common gauge of string for a 25 1/2 inch scale electric guitar is a .009 inch string for the 1st string, to a .042 for the 6th string. This is usually the gauge of strings that are on the guitar when it’s shipped from the factory. If you want a little thicker string gauge, you can try .010 for the 1st string, to a .046 for the 6th string. Since the scale (length of string) is shorter on these types of guitars, you will need to use a heavier gauge string to maintain the same string tension as the longer scale guitars with the lighter strings. So in this case use a .010 for the 1st string, down to .046 for the 6th string. Again if you want heavier, the next step up is .011 for the 1st string, to .048 on the 6th string. There are definitely all kinds of different variations in strings, so I’m giving you the most generic examples. And basic is a good place to start if you are new to changing guitar strings. Then you can start to experiment from there. Guitars made by Carvin, or Paul Reed Smith are a 25 inch scale. In that case go with the recommendations for the 24 3/4 scale guitars. What brands of electric guitar strings should you use? Like most brands, there are people who swear by one brand or another. Sometimes for good reasons, and sometimes just out of habit. 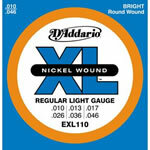 I use D’Addario strings most of the time on my electric guitars. 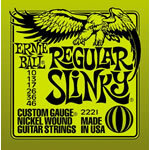 I have also used Ernie Ball strings in the past as well. 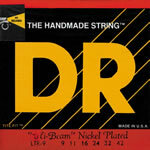 I have also heard good things about DR strings, but have not tried them myself. I probably should…but that would require me to change my habit 🙂 DR electric guitar strings actually come in a bunch of neon colors if you want to have a little fun. But those are at least a starting point for brands. And you can do your own experimentation with different string brands over time. The basic tools you should have on hand when changing your electric guitar strings are a pair of pliers, and peg winder. The peg winder is just going to make your job much easier and save you some wrist pain from winding the strings without it. In the video guitar lesson you will see me demonstrate how to use one.